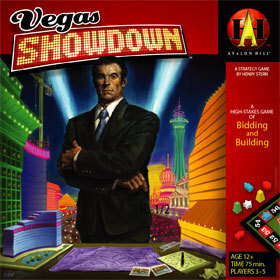 Players compete to build the most famous casino. Room tiles representing slot machines, restaurants, and other casino-related places appear on a central board and the players hold auctions to win the rights to have those rooms. Bidding wars escalate, values fluctuate, and designers renovate until finally the casinos are put to the test.